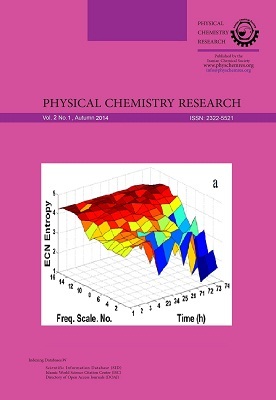 In the first part of this work, correlation between optical activity and elements of magnetic susceptibility tensor (MST) for five classes of model small molecules containing a single chiral center has been studied using quantum computational techniques at DFT-B3LYP level of theory with 6-311G basis set. Several molecular properties are used to reduce the MST elements prior to the examination of the correlation. This study showed a close correlation between optical activity and the off-diagonal MST elements reduced by the electronic spatial extent . In the second part of this work, effects of the type of substitutions and their distances from the chiral center on the optical activity of these molecules have been investigated. 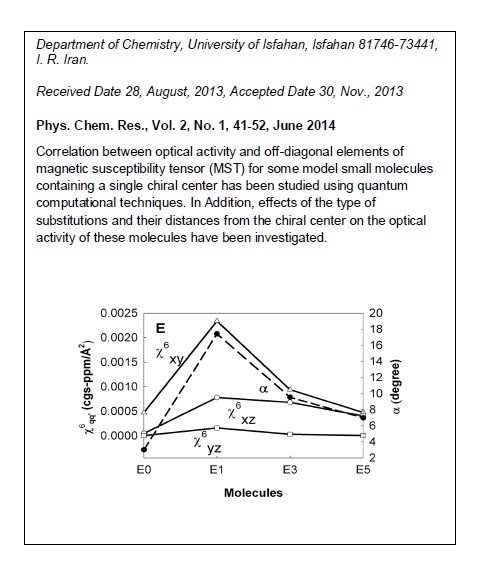 Results of this work show that optical activity is reduced effectively upon distancing the substitution groups from the chiral center. Furthermore, the set of substitutions with higher electron densities and larger differences in their electronic structures result in higher optical activity. L. Pasteur, Comptes Rendus de l’Académie des Sciences 26 (1848) 535. J.B. Biot, Mem. Acad. Sci. 2 (1817) 41. W.A. Hofer, V. Humblot, R. Raval, Sur. Sci. 554 (2004) 141. W.H. Brooks, W.C. Guida, K.G. Daniel, Curr. Top. Med. Chem. 11 (2011) 760. O. Yamashita, Opt. Commun. 285 (2012) 3740. T. Hata, H. Kawai, T. Ohto, K. Yamashita, J. Chem. Phys. 139 (2013) 044711. K. Jemovs, N. Saito, Y. Ino, T. Vallius, P. Vahimaa, J. Turunen, R. Shimano, M. Kauranen, Y. Svirko, M. Kuwata-Gonokami, Microelectronic Eng. 78 (2005) 448. A. Opitz, M. Horlet, M. Kiwull, J. Wagner, M. Kraus, W. Brütting, Org. Electron. 13 (2012) 1614. K.B. Wiberg, P.H. Vaccaro, J.R. Cheeseman, J. Am. Chem. Soc. 125 (2003) 1888. J. R. Cheeseman, M.J. Frisch, J. Phys. Chem. A 104 (2000) 1039. S. Janssens, C. Van Alsenoy, P. Geerlings, J. Phys. Chem. A 111 (2007) 3143. J.H. Brewster, Tetrahedron 13 (1961) 106. M.D’Abramo, M. Aschi, A. Di Nola, A. Amadei, Chem. Phys. Lett. 402 (2005) 559. P.L. Polavarapu, C. Zhao, Chem. Phys. Lett. 296 (1998) 105. K.B. Wiberg, Y. Wang, P.H. Vaccaro, J.R. Cheeseman, G. Trucks, M.J. Frisch, J. Phys. Chem. A 108 (2004) 32. S. Grimme, Chem. Phys. Lett. 339 (2001) 380. K. Ruud, P.R. Taylor, P.-O. Astrand, Chem. Phys. Lett. 337 (2001) 217. B. Mennucci, J. Tomasi, R. Cammi, J.R. Cheeseman, M.J. Frisch, F.J. Devlin, P.J. Stephens, J. Phys. Chem. A 106 (2002) 6102. P.L. Polavarapu, Chirality 14 (2002) 768. G. Boon, C. Van Alsenoy, F. De Proft, P. Bultinck, P. Geerlings, J. Phys. Chem. A 107 (2003) 11120. P. Geerlings, F. De Proft, Int. J. Molec. Sci. 3 (2002) 276. G. Boon, C. Van Alsenoy, F. De Proft, P. Bultinck, P. Geerlings, J. Mol. Struct. (Theochem.) 727 (2005) 49. G. Boon, C. Van Alsenoy, F. De Proft, P. Bultinck, P. Geerlings, J. Phys. Chem. A 110 (2006) 5114. L. Rozenfeld, Z, Physik 161 (1928) 52. E.U. Condon, Rev. Mod. Phys. 9 (1937) 432. E.U. Condon, W. Alter, H. Eyring, J. Chem. Phys. 5 (1937) 753. D.J. Caldwell, H. Eyring, The Theory of Optical Activity, Wiley, New York, 1971. J.H. van Vleck, The Theory of Electric and Magnetic Susceptibilities, Oxford University Press, Oxford, 1948. P.W. Atkins, R.S. Friedman, Molecular Quantum Mechanics, 3th Ed., Oxford University Press, New York, 1997. K. Ruud, T. Helgaker, K.L. Bak, P. Jørgensen, H.J.A. Jensen, J. Chem. Phys. 99 (1993) 3847. M.J. Frisch, G.W. Trucks, H.B. Schlegel, G.E. Scuseria, M.A. Robb, J.R. Cheeseman, V.G. Zakrzewski, J.A. Montgomery, Jr.R.E. Stratmann, J. Burant, C.S. Dapprich, J.M. Millam, A.D. Daniels, K.N. Kudin, M.C. Strain, O. Farkas, J. Tomasi, V. Barone, M. Cossi, R. Cammi, B. Mennucci, C. Pomelli, C. Adamo, S. Clifford, J. Ochterski, G.A. Petersson, P.Y. Ayala, Q. Cui, K. Morokuma, D.K. Malick, A.D. Rabuck, K. Raghavachari, J.B. Foresman, J. Cioslowski, J.V. Ortiz, B.B. Stefanov, G. Liu, A. Liashenko, P. Piskorz, I. Komaromi, R. Gomperts, R.L. Martin, D.J. Fox, T. Keith, M.A. Al-Laham, C.Y. Peng, A. Nanayakkara, C. Gonzalez, M. Challacombe, P.M.W. Gill, B. Johnson, W. Chen, M.W. Wong, J.L. Andres, C. Gonzalez, M. Head-Gordon, S. Replogle, J.A. Pople, Gaussian03, Revision A.6, Gaussian, Pittsburgh PA, USA, 2003. A. Baranowska-Laczkowska, K.Z Laczkowski, J. Comput. Chem. 34 (2013) 2006. A. Baranowska, K.Z. Laczkowski, A.J. Sadlej, J. Comput. Chem. 31 (2010) 1176. T. Helgaker, P.J. Wilson, R.D. Amos, N.C. Handy, J. Chem. Phys. 113 (2000) 2983. T.A. Keith, RF.W. Bader, Chem. Phys. Lett. 210 (1993) 223. J.R. Cheeseman, M.J. Frisch, G.W. Trucks, T.A. Keith, J. Chem. Phys. 104 (1996) 5497.